Sophie Maria Taylor was an artistically-gifted and popular pupil at St Richard’s Catholic College, Bexhill, so it was with great sadness that her fellow pupils heard the news of her death on 5 April last year after her brave battle with cancer at just 12 years old. I was asked by the pastoral leader of year 9 if I could coordinate a secret postcard auction to celebrate Sophie’s life and create a legacy in her name. We wanted to raise funds for The Royal Marsden Cancer Charity, who’d treated and cared for Sophie and her family. It has taken over six months to plan and get things in place for the auction. A friend, who works for a printing company, persuaded her boss to donate 2,000 pre-printed postcards for the event. Working out how to auction the postcards on eBay meant many, many phone calls. The Royal Marsden Cancer Charity set us up as a direct seller on eBay so 100% of the proceeds go straight to the charity and we don't have to pay any fees to auction the postcards. Finally, when everything was in place, I began to ask for submissions. I began by creating a pack for every tutor with the preprinted postcards, posters and a presentation about the event. We asked pupils to donate £1 for a pre-printed postcard which they could either create work for or pass on to a friend or relative, this has raised over £500 so far. I gave the English department 200 postcards, they set homework for pupils to write to celebrities and/or create their own work. I wrote to every local gallery and artists in East Sussex and sent them 5 postcards and enclosed a stamped addressed envelope. As postcards started arriving, I started to email as many galleries, groups and artists that I could think of to submit their creations to the on-line auction - including sending 100 postcards to be sent in the Sketchbook Circle mailing. It was clear that we needed to exhibit the work so I asked portfolio box if they could help and they have supplied the website for free. This took a few days to set up but has been very easy to upload work once in place. I have had to be very organised with the postcards which are numbered, photographed and published online as I have received them. The response has been overwhelming. Over 550 postcards have arrived from pupils and artists from as far away as Australia. Sir Quentin Blake has submitted two drawings, Thomas Taylor, who illustrated the first Harry Potter cover, Bob and Roberta Smith, award-winning portrait artist Laura Quinn Harris and BBC radio DJ Fearne Cotton have all submitted wonderful works of art on the back of a postcard. Loui Jover sent three original postcards and also donated an amazing A4 work to add to the auction. There has also been a phenomenal support from the talented amateur and professional artists here in East Sussex and of course the pupils work has been wonderful. You can see the full list of artists on the website. I have been using social media via our twitter account (please follow us... @strichardsart) and Facebook to get the message out. Sharing the amazing work and thanking the amazing artists. I am currently putting all 550 postcards on eBay - there is no easy way to do this and it has taken for ever!! 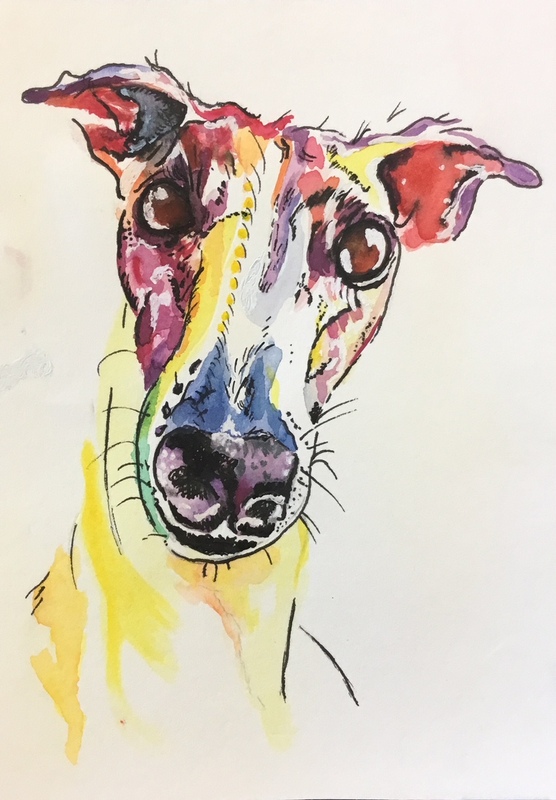 Sophie's Secret Postcard Auction has been a great way to engage pupils with art, they have loved seeing their work online and there is a real feeling of excitement about the auction. It has been a fantastic project for the art department and has raised the profile in the school. We are hoping to raise lots of money for the charity and also keep Sophie's memory alive. On behalf of St Richard’s Catholic College, the Royal Marsden Cancer Charity and Sophie and her family, I can’t thank everyone who has helped and created work for this fantastic event enough. I am very excited about the auction and will be spending Saturday 16th June with friends and family following the sale which I hope will raise lots of money for The Royal Marsden Cancer Charity. Please can sketchbook circle members share the event and encourage people to look. Sophie’s Secret Postcard Auction is not just a chance to get your hands on an original work of art for a tiny price, but you’ll also be supporting The Royal Marsden Cancer Charity with all funds going directly to the Charity. I am a part-time Art Teacher at St Richard's Catholic College, Bexhill, UK and trained as a teacher after having my son 9 years ago. My first career was in advertising as a graphic designer and studio manager which has been incredibly helpful with this project. I am a practising artist (www.miramiramiranda.com) and have taken part in the sketchbook circle for the last 4 years. I currently run a sketchbook circle group with 15 staff at St Richards. Sophie's Secret Postcard Auction click link for all details.